A Spaniard In The Works! We wrote recently - here - about how the must-have accessory for the garden was a pizza oven. Well, it seems there is a new contender for the pizza oven’s crown – the paella burner. Anyone who has ever tried to cook a paella on top of their hob will know the problem. You get things bubbling away in one corner of the pan, but other areas just don’t get enough heat to allow even cooking of the rice. You end up having to twirl the pan around to catch the flame, with the risk of burning your fingers in the process. A paella burner solves this problem. They are used extensively both indoors and outdoors in Spain and are the reason restaurants can cook up a beautiful, evenly- cooked paella with no trouble at all. Whereas traditionally paella was cooked out of doors on a barbeque or open fire of seasoned wood and twigs, a paella burner operates with bottled gas. Apart from allowing you to cook things evenly, the paella burner also gives the rice that distinctive burnt crust – known as socarat – which is so much prized by Spaniards. 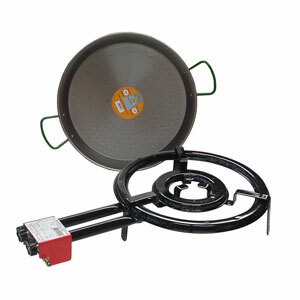 Paella burners are available online in a range of sizes to suit your paella pan itself. Try the Tapas Lunch Company for a decent range of pans and burners. Lastly, a quick word about the pan. Try to avoid the flimsy steel or iron pans you can pick up in an ironmongers or hardware store or even in a supermarket. Best bet is an enamelled steel pan – usually black with distinctive white and blue speckles – they can stand up to the heat of a burner or indeed the oven if you prefer to make “arroz al horno” – without buckling in the heat.